Manchester, NH – Red Arrow Diner is proud to announce that its owner, Carol Lawrence-Erickson, was named Restaurateur of the Year in the 2018 Stars of the Industry Awards presented by the New Hampshire Lodging and Restaurant Association (NHLRA). According to the NHLRA, the awards recognize individuals who have achieved significant success and growth in their establishments; who have supported the industry and its concerns on national, state or local levels; who have provided opportunities for growth for their personnel; who set the standard for customer service; and who embody the spirit of hospitality. Carol Lawrence-Erickson has over 30 years of experience managing various restaurants, including her own. She has earned national exposure through print, television and radio media as well as expanded the Red Arrow Diner brand to four locations across New Hampshire. Even in the infamously competitive hospitality industry, Carol continually advocates collaboration to build a thriving economy that benefits everyone and finds various ways to support her colleagues and their locations. Among her many charitable interests, Carol and the Red Arrow Diner are avid supporters of the annual Tower of Toys holiday fundraiser, Make-A-Wish NH, and Perkins School for the Blind. 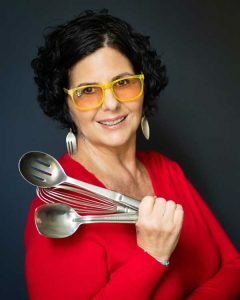 She also conducts countless fundraisers through her diners and provides generous donations for a wide variety of causes. Carol was honored alongside additional Stars of the Industry recipients at the 2018 Stars of the Industry awards dinner on November 5, 2018 at the Courtyard by Marriott in Nashua, New Hampshire. A privately-held company based in Manchester, New Hampshire, the Red Arrow Diner operates restaurants in Concord, Manchester, Milford and Londonderry, New Hampshire, United States. Each Red Arrow Diner location is a 24-hour diner and serves over 500,000 breakfasts annually. The Red Arrow Diner has been featured on various nationally-broadcasted television and radio shows, including the Food Network’s Diners, Drive-Ins and Dives and SiriusXM political channels Patriot (125) and Progress (127). Additionally, Red Arrow is an active community supporter with countless volunteer hours, pro bono promotions, and financial donations. For information about the Red Arrow Diner, visit www.redarrowdiner.com.